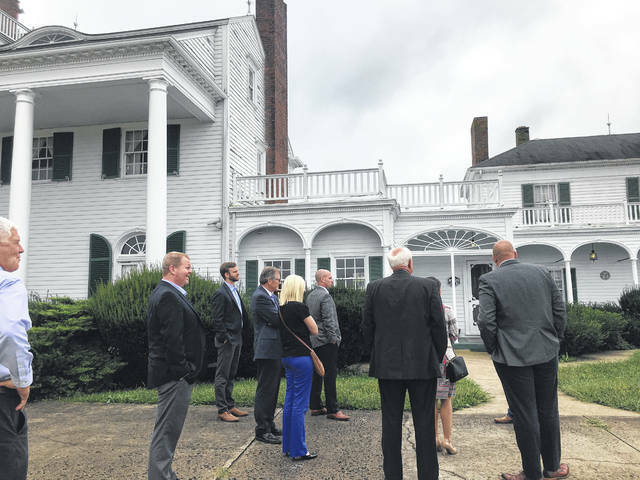 Earlier in the month, Lance Thornton gave a tour of the Morgan Mount Vernon Mansion. POINT PLEASANT — A public meeting has been scheduled in regards to the land development plans at the recently purchased Morgan Mount Vernon Farm and Mansion of Southside. The meeting is set for Thursday, Oct. 11 at the First Church of God in Point Pleasant, time is to be announced. Lance Thornton, of The Thornton Group & LandSu Land Development, Inc./co-chairman of Erie Automotive Aftermarket Holdings, shared the purpose of this meeting is to allow the residents to give their input on what they would like to see in the Yogi Bear Jellystone Park Camp and Resort and outside of it. Thornton said he will answer any questions the residents may have and will ensure they have all of the facts on the project. He commented some concerns have been brought up about the plans for the mansion and the county tax revenue. Thornton said he wants “to draw some excitement around the project and help the residents.” He added, if needed, this may go to a vote for bonds. Thornton shared he and wife Susan, medical director for Mason County EMS and ER physician at Pleasant Valley Hospital, are planning to move into the home temporarily in order to refurbish it, bringing it up to newer standards and bringing the home up-to-date while preserving the passion Dr. Morgan had for the home and the land. Thornton commented he and Susan will continue to keep up the home as a thank you to Dr. Morgan. He shared once the home is refurbished, they would like to find an innkeeper for the home and turn it into a bed and breakfast. Also, they have plans to make the area available as a wedding venue, turn the outdoor pool into an inside one, and also have a vineyard on the property where they can sell wine. Thornton shared he and Susan are excited for this entire project as well as excited to break ground on the project. He said they are pleased to see people who are happy to see this project is in motion and are thankful to those who are being encouraging and supporting. Thornton commented he and Susan love helping their fellow man whether it be providing them with jobs or giving them a warm meal. He shared this Thanksgiving season, he and Susan will be giving out 100 turkeys and Thanksgiving dinners in Point Pleasant. Thornton reported he and Susan have been continuing to meet with developers and continue to look for contractors and excavators for the project. They are also waiting to get approval to install a sewer system. He shared he wants the project to stay in Mason County, but if plans do not follow through, they have secured land in Putnam County as a back up.